I woke up this morning thinking, I bet all of those people out in the blogosphere are really just itching to know about my fabulous day. I mean really, the excitement is over underwhelming. So here it is in a nutshell, because I don't want to be the reason for you losing any sleep. 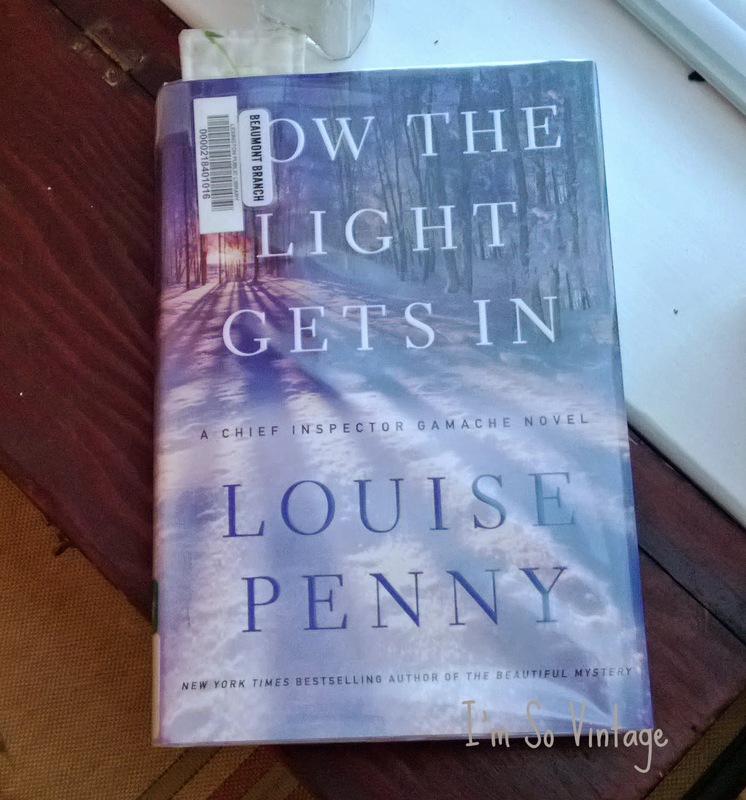 Went to the library and picked up this wonderful book to read. I decided to go through the bags of clothes I tossed into my car in North Carolina a couple of weeks ago. Mostly old tee shirts, etc. but in the middle of one I found this. As you can see, they are a bit wrinkled and musty smelling, but they were my mom's baby clothes. So I am thrilled. A little hand washing and ironing will have them back in wonderful condition. Okay, that was exciting, but now on to the really good other stuff. While going through the bags and checking out my closet I realized my fall wardrobe is a bit lacking, so I went shopping. It takes a lot to get me clothes shopping. I don't know about you, but I hate those fitting room mirrors. I did come away with a few basics, but couldn't find any shoes or boots that I like without selling one of my feet to pay for them. I already have lots of turtlenecks so I can mix and match. Next is a self pedicure. 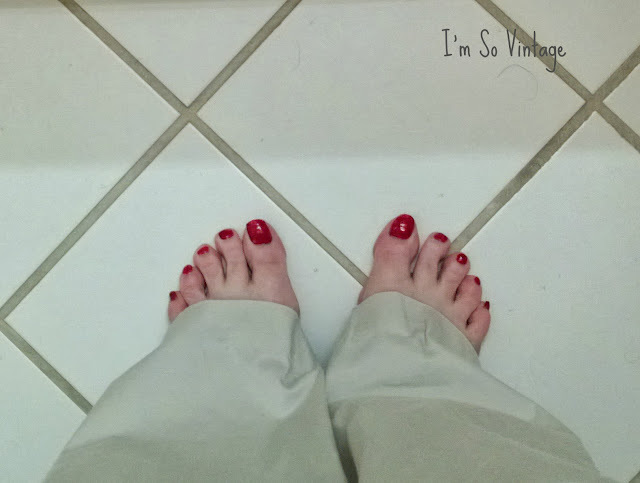 I realized that my toenails are less than spiffy and even though I am now wearing closed toe shoes, I may want to go and check out a few more shoe stores today. Then it is off to Trader Joe's and Whole Foods. 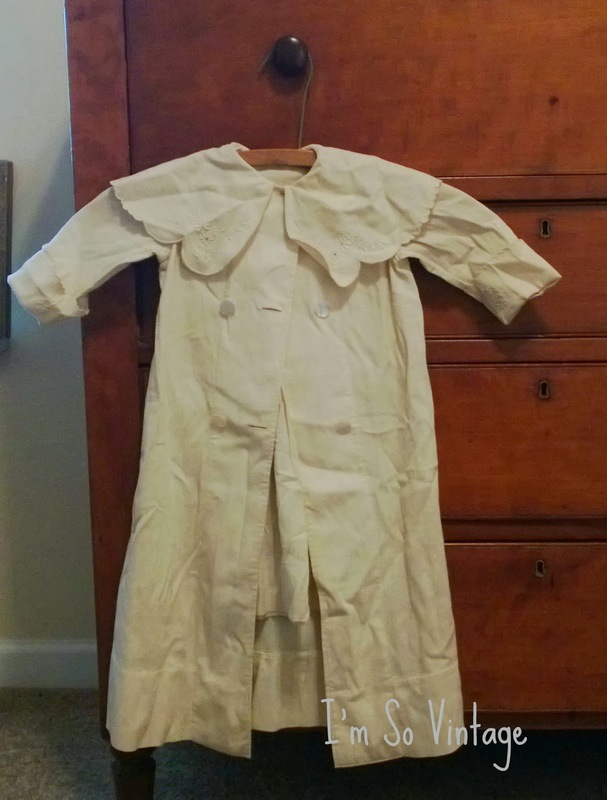 Your mom's baby clothes, what a treasure!! the vintage baby dress is beautiful, I also like the new skirts and sweater!! Pretty toes! That baby dress is so pretty and I am happy for you that you found an unexpected treasure! I'm so happy that you found another family heirloom and hope there are more hiding in boxes and bags still. I went clothes shopping yesterday and I hated every minute of it. Ugh those mirrors are the worst. Your toes look good...I love bright polish! And I'll look for these books. I need to figure out which one to read first! Sweet hugs! What do you mean not so exciting??? How fun to find your mother's clothes! I bet she had something to do with that and probably wanted to let you know that she is with you. Love the new sweater and your pedicure looks mahveloussss....Have a wonderful day!!! We just got a new library right down the street from my house, so I may need to check out that book! Today would've been a good day to read a book since it was cloudy and chilly. Love the little outfit you found that once belonged to your mom. You're lucky to have things that date back that far. Love your new sweater! 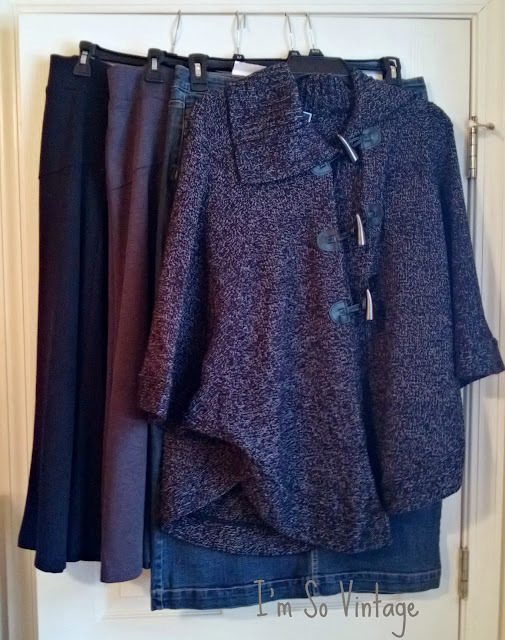 I am ready for it to get cooler here so I can wear some of my new clothes! Your day is just what I needed to hear about, a little self-pampering. Love the baby dress! What a nice surprise. This is the second blog today that talked about self-care. We can get so caught-up with other daily activities that we don't pamper ourselves. That novel looks interesting. I haven't read one in a long time. I am glad that you are finding some of your treasures intact. Did the nasty person ever say why she was so nasty about you getting your things. Oh my....I love that baby dress! A good book, your mom's baby clothes, a FANTASTIC poncho!!! Sounds like a good day to me. I'm glad I'm not the only one who forgets to bring the reusable bags to the store. Love the baby clothes - what a treasure! What a treasure to find your mom's baby dress! At least you don't walk out the door without your keys and lock yourself out like I did! An underwhelming day is such a blessings, isn't it!!! :D I always forget my reusable grocery bags. DOH! I really need to go shopping....I need workout clothes! I hope it's also underwhelming! 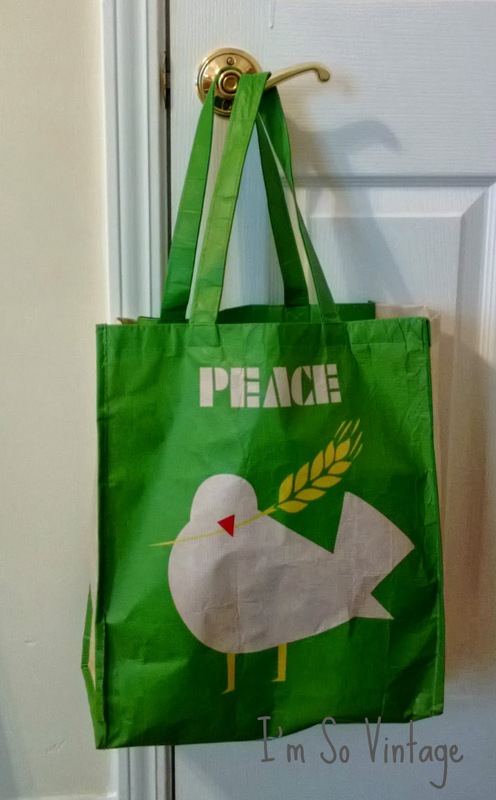 I love the peace bag! Otherwise, I think it is more than exciting to have your mother's baby clothes. And I so envy you for having the peace of mind to read a book. With so many changes in my life, I hope I will be able to do the same soon.